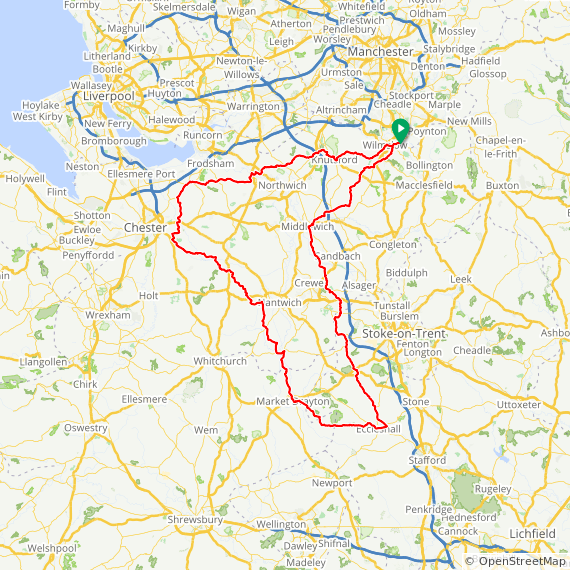 A revised route for 2019, with fewer controls, and a safer crossing of the A556. Through Delamere Forest to Helsby, then a long flat ride through wonderful Cheshire countryside to Waverton, by Beeston Castle and Bunbury to Eccleshall. The return is through the picturesque village of Maer, and (a change for 2019) to Middlewich. Although a bit more bumpy there are no big climbs, so this ride is suitable for 'fixed' bikes. This ride shows you the Cheshire countryside at its best, with some lovely quiet lanes and no big climbs, although it's by no means absolutely flat. The first part takes you through Knutsford and Great Budworth before climbing over the low-lying Delamere hills on the way to Helsby. On a clear day you get a great view over the Mersey marshes over towards Liverpool and the Welsh mountains. Then it's flat all the way through some lovely traditional Cheshire countryside with some fine views of Beeston castle, via Waverton and Bunbury. After Audlem, Cheshire gives way to Shropshire and Staffordshire, through Market Drayton and to Eccleshall and the garden centre cafe. The return to the Stockport area goes through the beautiful villages of Maer, Madeley and Betley, then through Haslington and Middlewich. The route revison in 2019 was undertaken in response to changes to roads and controls since the Perm was first set up. A busy crossing of the A556 is now avoided, as is M6 junction 17. All controls have 24/7 options.